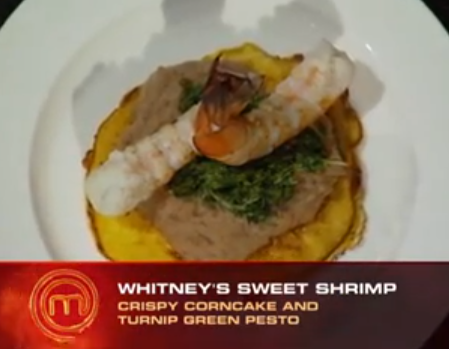 Jennifer was given three dishes cooked by last year’s Masterchef winner, Whitney Miller, to choose from for everybody to cook. 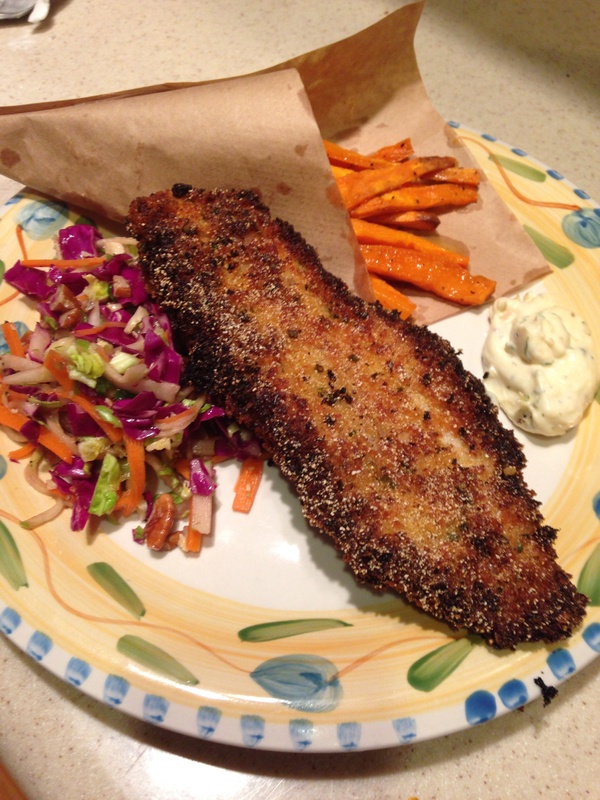 She chose her Crispy Catfish with Dill Tarter Sauce, Homemade Slaw and Sweet Potato Fries. 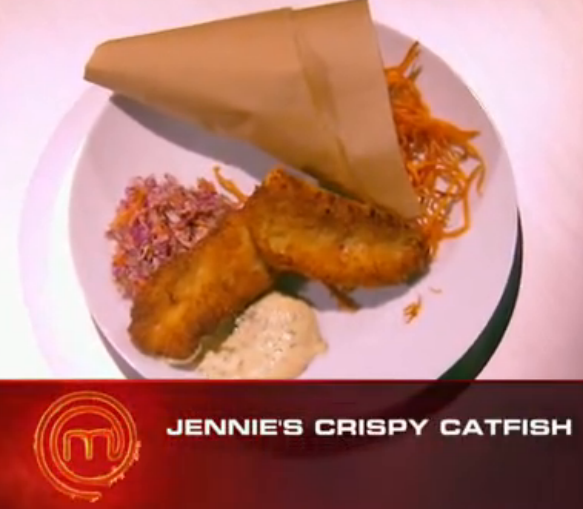 The contestants had to recreate the dish with no recipe while Jennifer was given a basket of all 29 ingredients needed to cook the dish. Christian and Ben had the best recreations and were named captains for the next challenge. 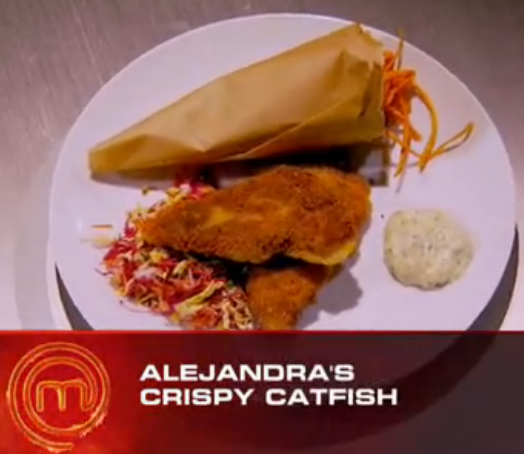 The bottom three were Alejandra, Adrien, and Jennie, with Jennie being the one who was sent home. 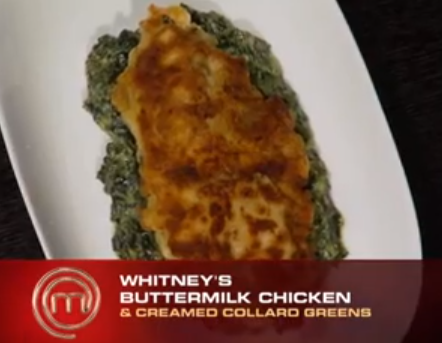 Since I obviously was not able to taste the dish that I needed to recreate, I instead tried to find Whitney’s recipes online. 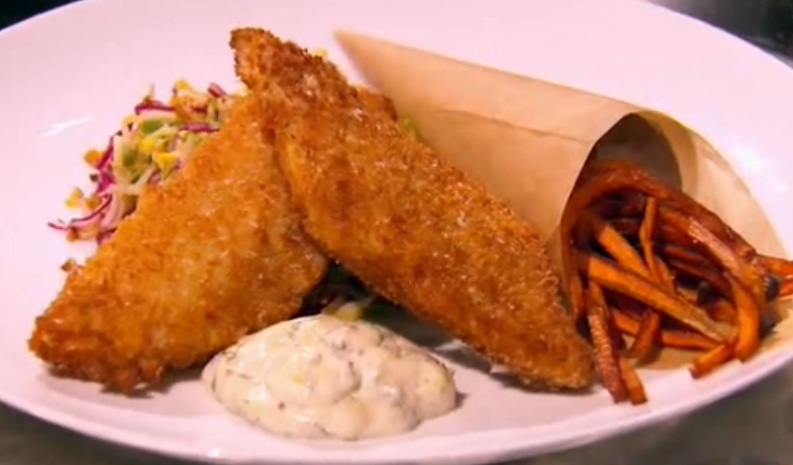 While I was able to find these: Whitney Miller’s Oven-Fried Catfish with Fresh Dill Tartar Sauce and Sweet and Spicy Cole Slaw, neither was a perfect replica of what was shown on the episode. So I used these as a basic guideline for what flavors she usually incorporates and took notes of everything that was said about the dish by the judges and chefs. 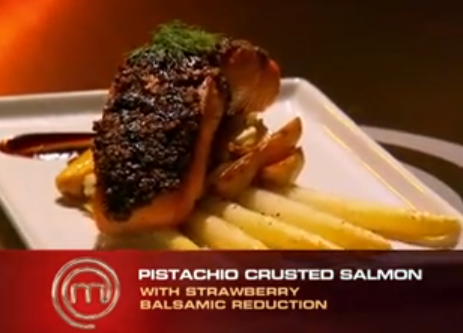 With all of this info, I think I was able to get a pretty solid recreation of the dish. (Note: I was really just winging all of the components so all measurements are really just approximations). 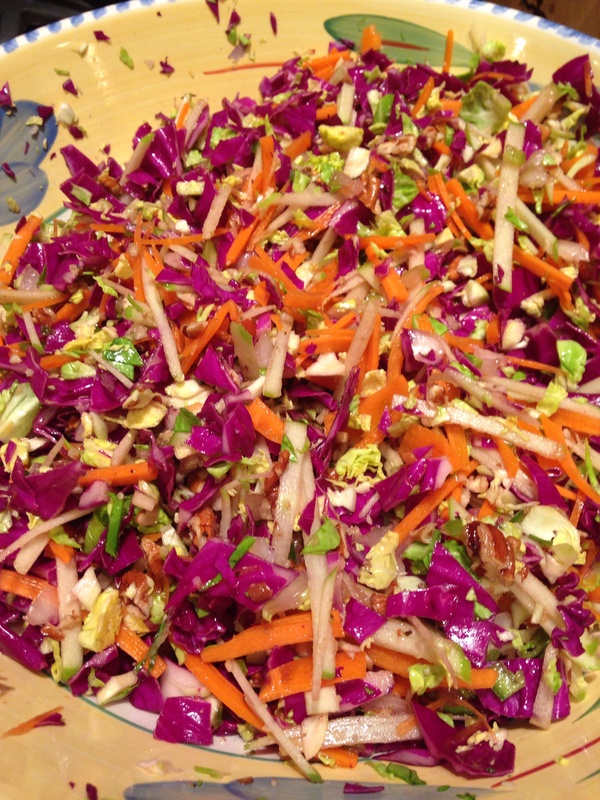 The first component that I tackled was the cole slaw. In a large mixing bowl, I combined 3/4 of a small head of red cabbage (coarsely chopped) , 20 brussel sprouts (coarsely chopped), 1/4 of a yellow onion (finely chopped), 1 small granny smith apple (julienned), 1 jalapeño (finely chopped), 4 small carrots (julienned), and 2 handfuls of pecans (finely chopped). 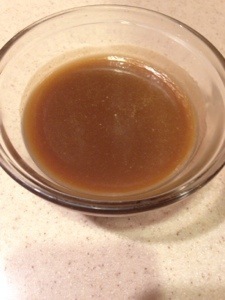 Then, I made the dressing by whisking together 1/2 of a cup of apple cider vinegar, 2 tablespoons of balsamic vinegar, 1/2 of a cup of olive oil, the juice of 1/2 a lemon, 2 tablespoons of honey, and salt and pepper to taste. 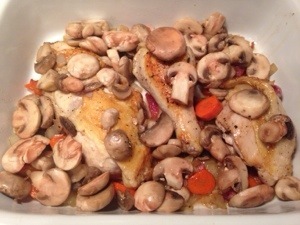 I tossed this all together and then let it marinate in the refrigerator until the rest of the components were ready. 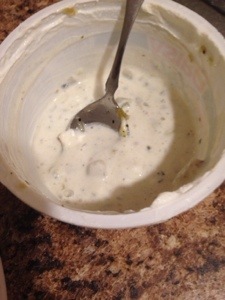 Then, I put together the dill tarter sauce for the fish. 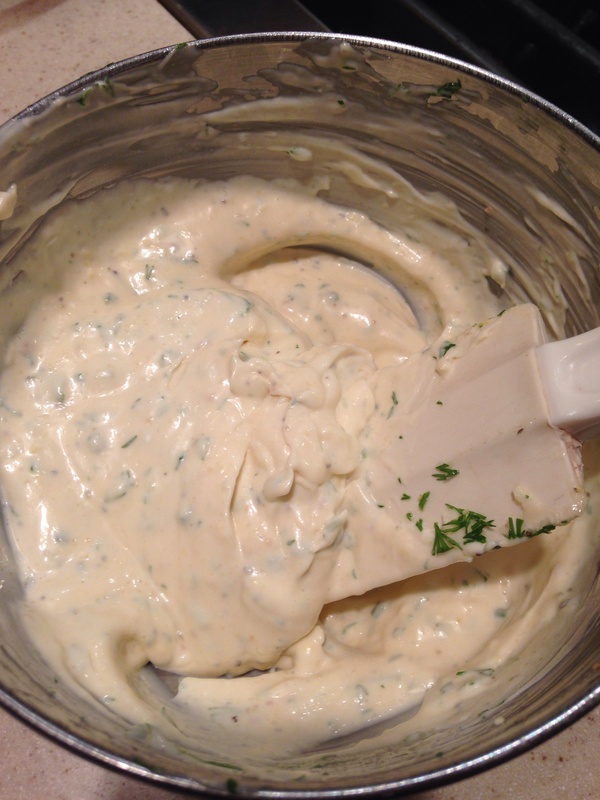 For my sauce, I combined 1 cup of mayonnaise, 2 teaspoons of ground mustard, 1 teaspoon grated lemon zest, the juice of half a lemon, 2 teaspoons of fresh dill, 1 teaspoon of fresh chives, 1 teaspoon of salt, and a pinch of black pepper. I originally did the sauce exactly as her recipe called for but I thought it tasted like nothing more than mayo so I added salt and doubled the amount of lemon and dill to get more flavor. Next, I prepped the sweet potato fries. 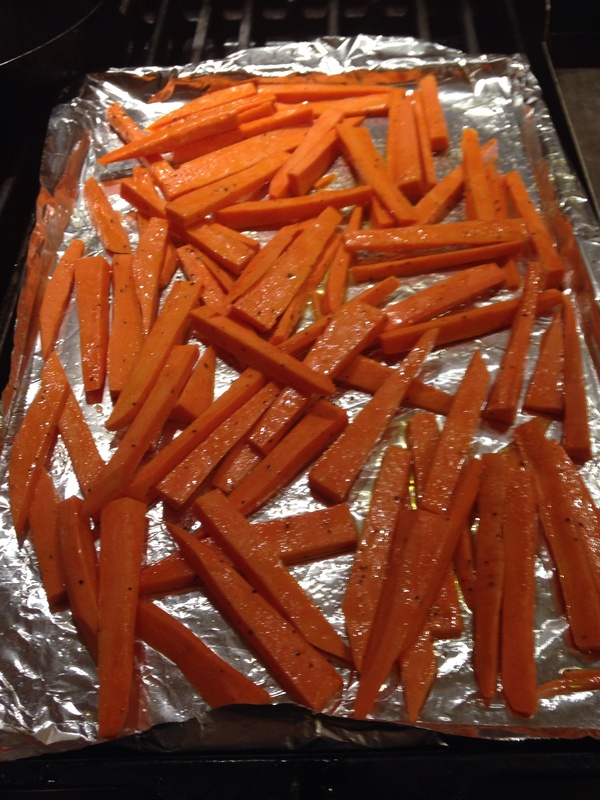 I simply cut the sweet potato into thin, long strips and tossed the strips in olive oil, salt and pepper. 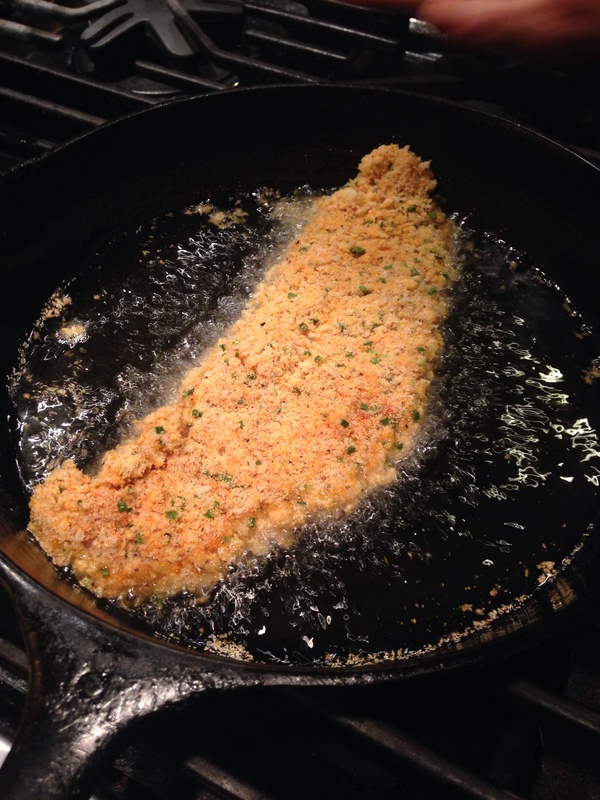 When I started frying the fish, I put the fries into a 450 degree oven for 15 minutes. I know the original dish called for fried instead of baked sweet potato fries, but I am a novice fryer and thought that I might get a bit overwhelmed with frying more than one component. Finally, it was time for the catfish. 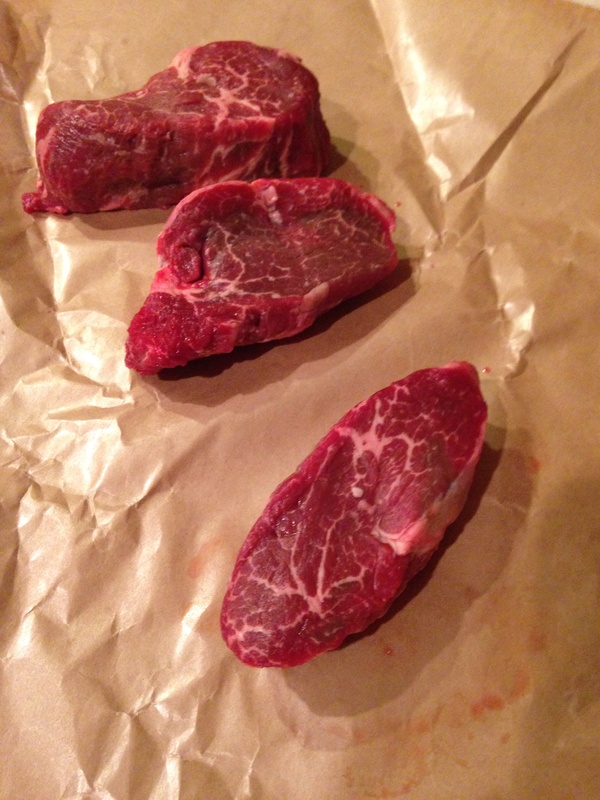 First, I let the filets soak in buttermilk for 5-10 minutes. 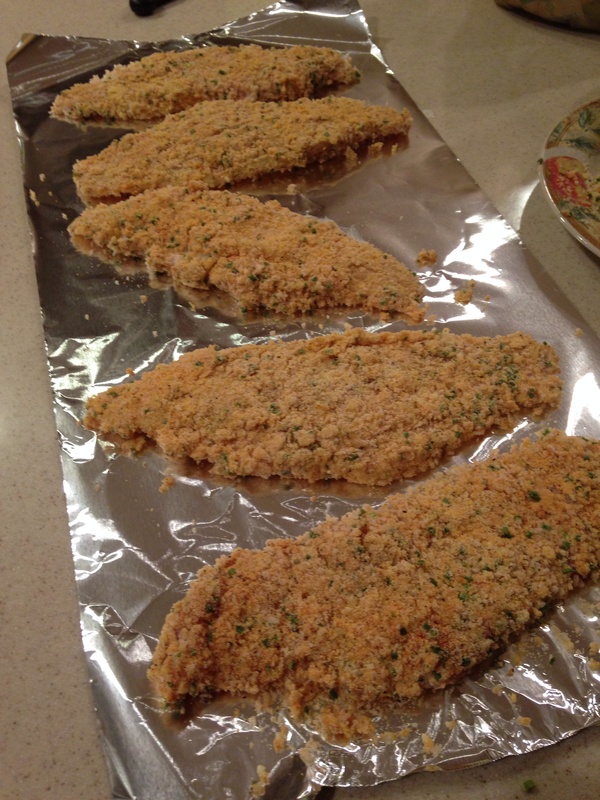 Then, I coated each fillet in a mixture of panko, corn meal, salt, pepper, paprika, garlic powder and chives. 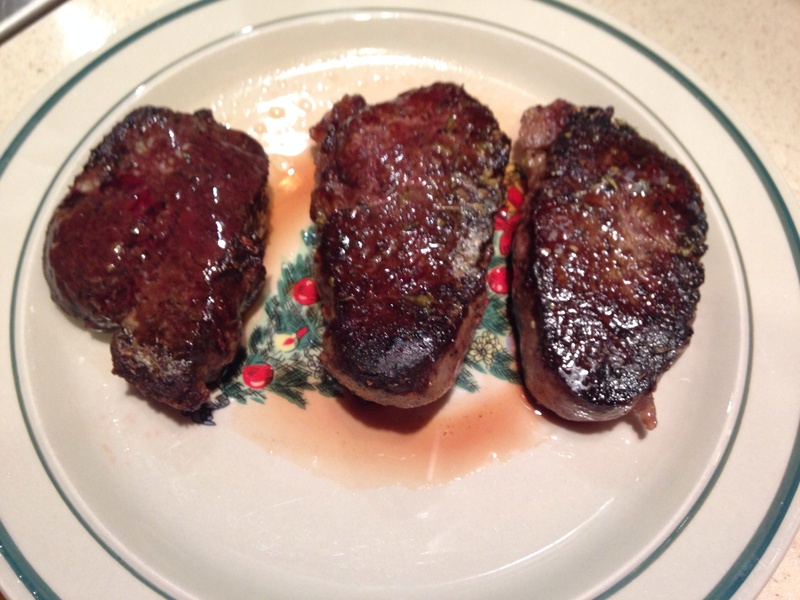 After fully coating each filet, I fried them in crisco for 2 minutes on each side. 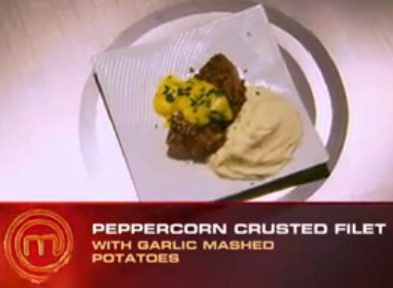 This completed the dish and I plated it just like Whitney did (since that was a major issue with the judges). All in all, the dish came together well. 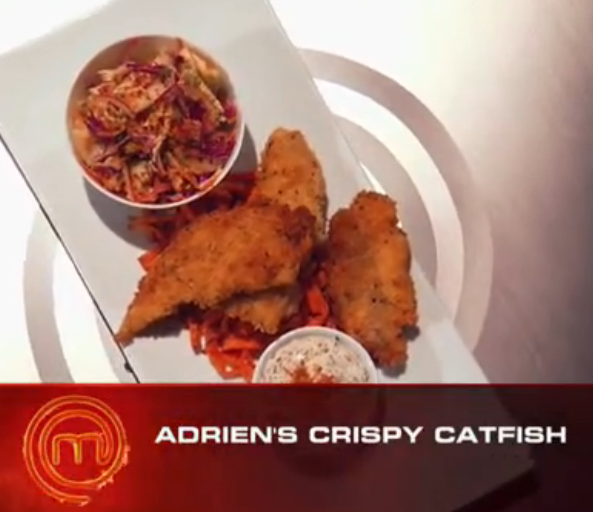 The cole slaw was surprisingly delicious and the dill sauce paired perfectly with the catfish. 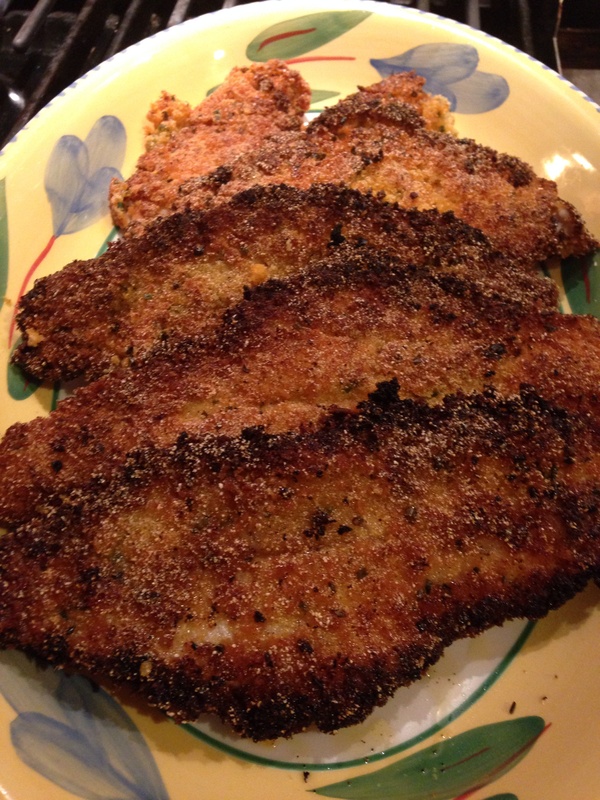 The breading on the catfish got a little dark so I maybe should have fried it a little less. And I should have fried the sweet potatoes because the baked fries were not as crispy as I was wanting. 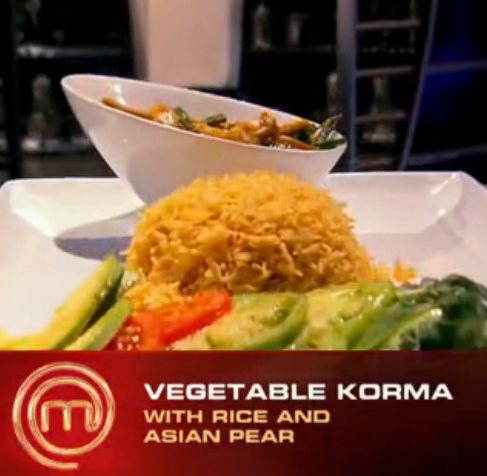 Overall though, everything tasted great and I think it was a pretty decent recreation of the dish. This week’s mystery box challenge asked the chefs to create a restaurant-quality vegetarian entree out of some of the following ingredients: purple fingerling potatoes, goat cheese, phyllo dough, green and red tomatoes, asian pear, basil, shallots, avocado, beets, mushrooms, asparagus, eggs, rice, cumin, lemon, arugula, parsley, green beans, japanese eggplant, smoked paprika, moroccan spice, curry powder and a variety of other herbs and spices. 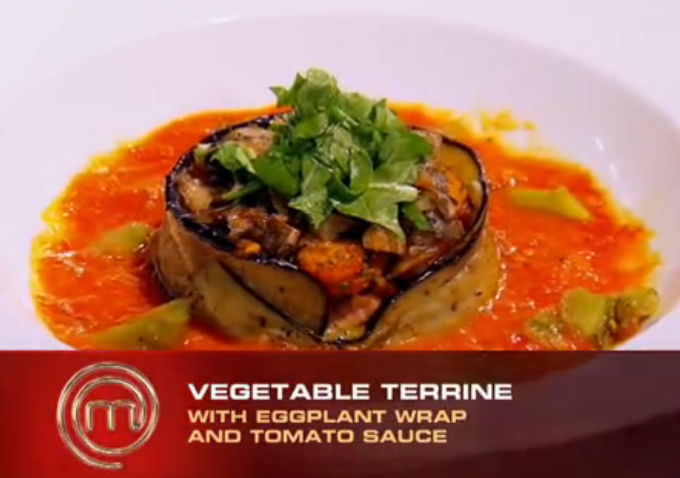 Jennifer (Vegetable Terrine), Adrien (Green Gazpacho) and Alejandra (Vegetable Korma) landed in the top 3 with Jennifer winning overall, allowing her to pick the focus for the next challenge. 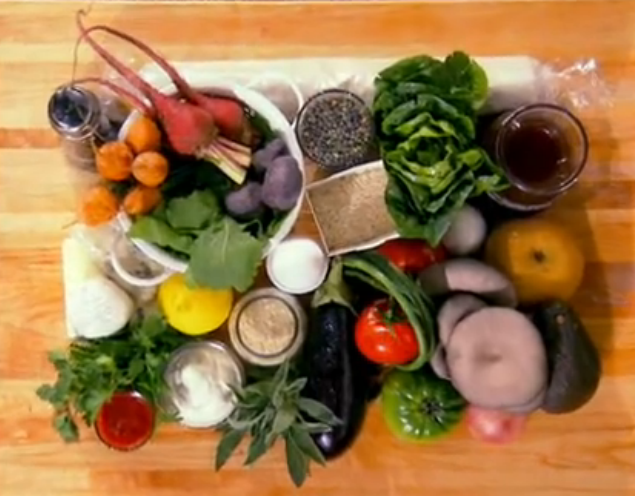 As soon as I saw that purple potatoes were part of the mystery box, I though that it would be really cool to do a purple potato gnocchi with oven roasted vegetables. However, when I went to the store, I quickly realized that finding purple potatoes to work with was going to be an issue. I had to settle for red skin potatoes but I was confident that it would work out since I had made gnocchi successfully before using this recipe: Simple Potato Gnocchi. The first thing I did was boil about a pound and a half of red skin potatoes until they were tender. 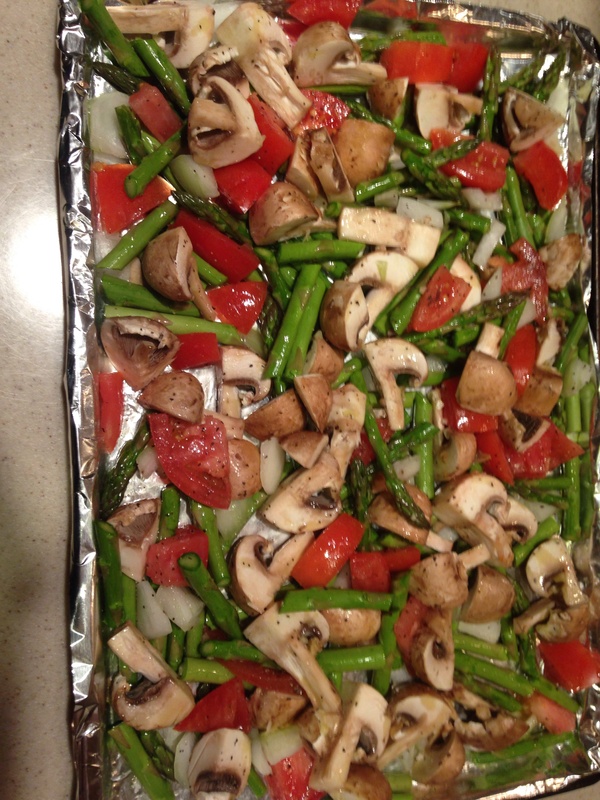 While the potatoes were on the stove, I prepped the vegetables for the dish. I cleaned and cut a bunch of asparagus in to thirds. Then, I chopped 1/4 of a yellow onion, quartered 8 ounces of baby bella mushrooms, diced 1 tomato and minced 2 cloves of garlic. I mixed all of this together and laid it out on a lined baking sheet. Then, I drizzled it all with olive oil and sprinkled it with salt and pepper. I put this whole mixture in a 350 degree oven after I had prepped the gnocchi and started the boiling process per the recipe link above. As the gnocchi popped to the top of the boiling water, I transferred them to a pan with some melted butter and warm olive oil. I tossed them in this mixture to keep them warm and to keep them from sticking to one another. 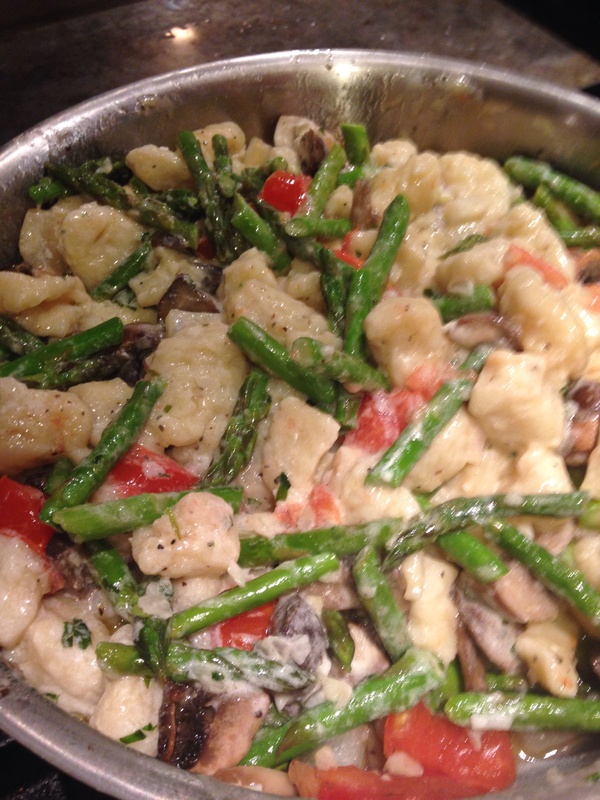 Once all the gnocchi were in this pan, the oven roasted vegetables were done. 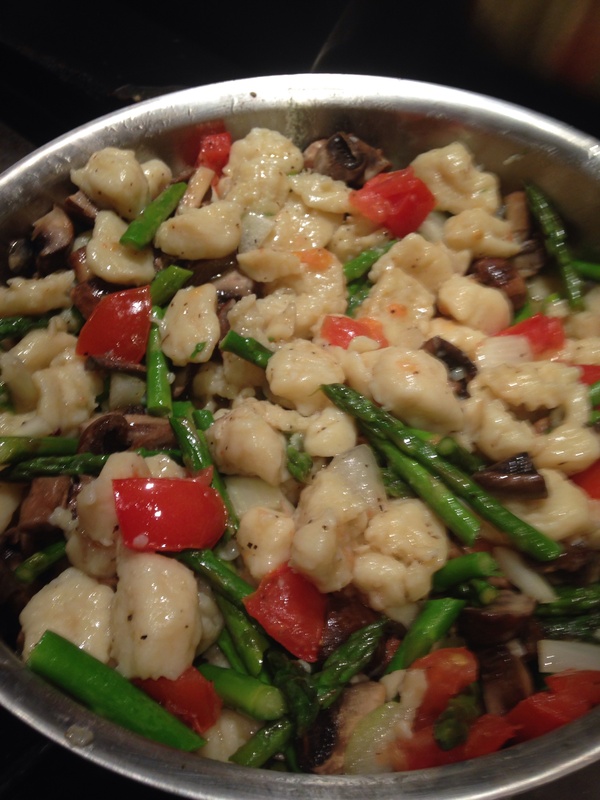 I transferred all of the vegetables into the pan with the gnocchi and tossed the whole mixture. Finally, I started the sauce. I melted 4 tablespoons of butter in a sauce pan. Then I added 1/2 of a shallot (finely chopped), 4 cloves of garlic (minced) and 4 leaves of fresh basil (finely chopped). After a few minutes of cooking, I then added in 4 ounces of goat cheese, stirring while it melted to make sure everything combined evenly. I poured the sauce over the gnocchi and vegetables, sprinkled salt and pepper to taste, and mixed it all to coat evenly. I let the whole mixture cook on low heat for a few minutes to ensure that all the flavors could come together. 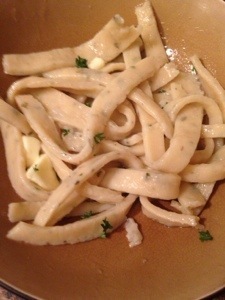 And then I served it with a garnish of shredded parmesan. Overall, the dish came together pretty well. The flavor was great but the gnocchi did not hold up very well. I think using the red skin potatoes instead of the traditional russet potatoes threw off the dough. I could tell immediately that it just was not coming together as well as it had before. 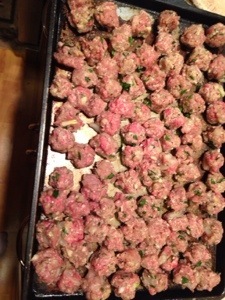 I also just made a half recipe (unlike before) and that could have thrown proportions off as well. 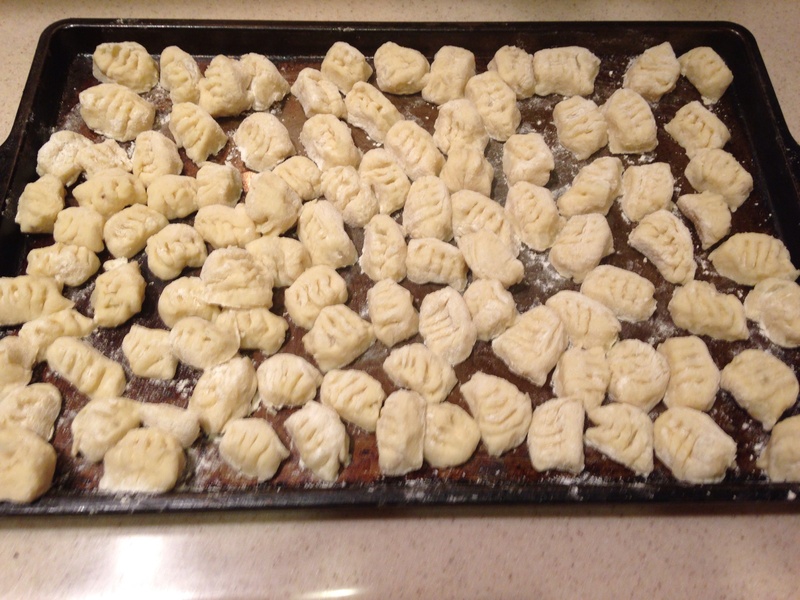 The gnocchi stayed mostly in tact but I do think that it would have been much better had I used firmer potatoes. I haven’t really worked with purple potatoes so I’m not sure if that would have been an issue with them, but I do think the dish was delicious and very good looking regardless. After losing the team challenge, the Red team was sent into the pressure test. 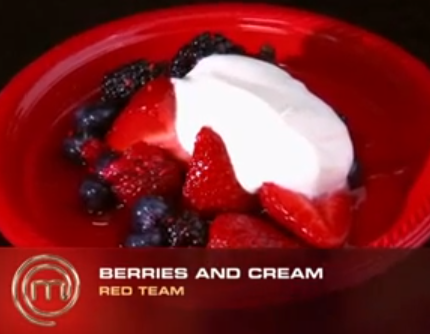 However, only two chefs (as picked by the team captain) had to compete to keep their spot. Esther picked Max and Christine for this “honor.” The challenge was to cook three pieces of steak rare, medium, and well done. Christine undercooked her well done steak but got the other two steaks perfectly done, and Max was slightly off on each one. As a result, Max was sent home. This challenge is probably the most difficult that I have encountered. I have never really cooked much steak and I certainly have not done it to a specified level of doneness. In the past, I’ve just cooked it until I thought it might be ready and then cut through the middle to figure it out from there. I knew that that was not an actual culinary technique so I sought out advice for how to do this properly (without having to poke the steak repeatedly with a thermometer). 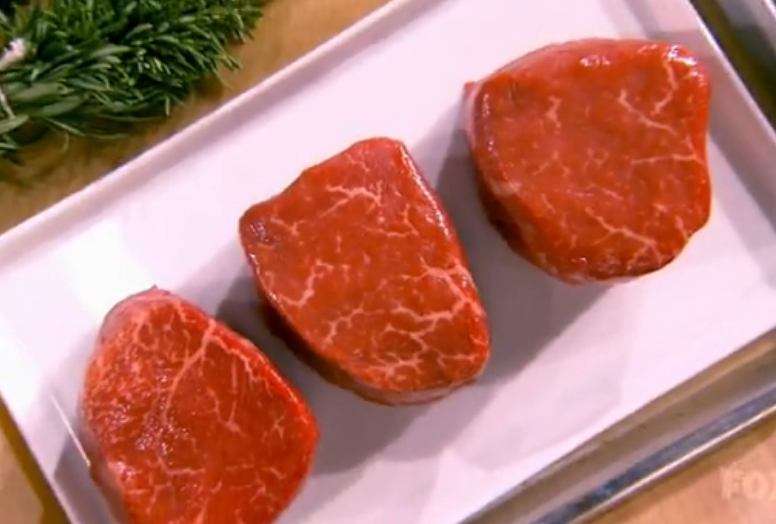 I found this extremely helpful resource, which I used (in addition to the picture on the right) as a guide: How to Cook Perfect Filet Mignon. I brought the steaks to room temperature, and seasoned them with Lawry’s Seasoned Salt, Pepper, Thyme and Oregano. During this time, I preheated the oven to 450 degrees and also preheated my cast iron skillet on the stove. When the steaks were ready to cook, I put a couple tablespoons of olive oil in the pan and let it heat up. 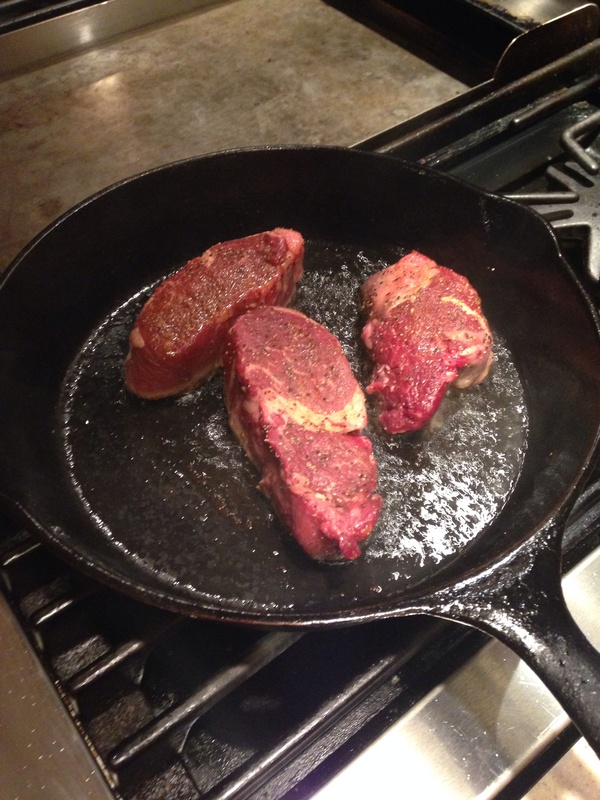 Then, I put the steaks in the skillet and let them all sear on that side for 3 minutes. I flipped them and let them sear for another 3 minutes on the other side. With 2 minutes left on the stove top, I put a pat of butter on top of each steak to keep it moist. At this point, I pulled off the rare steak and let it rest. I then put the skillet with the other two steaks into the oven. After 3 minutes in the oven, I pulled out the medium steak and let it rest as well. I gave the last steak 4 more minutes in the oven before I took it out to let rest. Overall, for my first time making steak without the help of a meat thermometer and not cutting into the steak to check the color, I thought the steaks turned out pretty well. 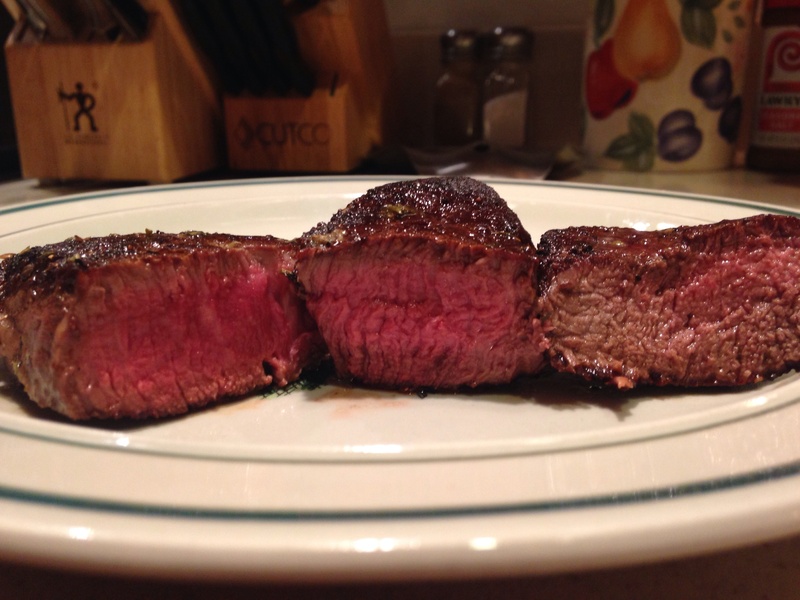 The rare steak turned out perfect and it was definitely the easiest one to do well. The medium steak needed a little more time in the oven. Just by looks, it was more red than pink in the middle but I felt that the texture of the steak was more on the medium side. The well done steak also got pretty close but there was still some pink left in the middle. I was slightly off on each but I now know in the future what needs to be done. (However, that sentiment probably would not have saved me during this elimination). Overall though, the seasoning on the steaks was great and they all stayed moist and delicious regardless of the temperature. Employment Update: I wrapped up my position with Churchill Downs and have moved back in with my parents. (Whomp. Whomp…) I am back to the full-time job search, AKA as the worst thing ever, but there have been some exciting things happening and I have been pretty productive recently. Since my last post (sorry – I know it’s been a while): 2 phone interviews, 20+ e-mails and LinkedIn messages, and 5 job applications. This week’s team challenge had the two teams catering a five-course meal for 350 office workers in the building that included a soup, a salad, pizza, a special entree and dessert. 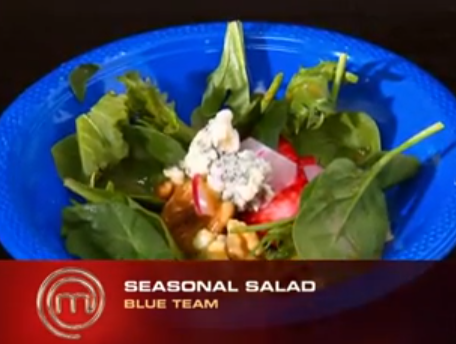 The Blue Team produced Chicken Chili, Seasonal Salad with Blue Cheese and Nuts, Arugula and Bruschetta Pizza, Beef Hamburgers and Chocolate Chip Cookies. 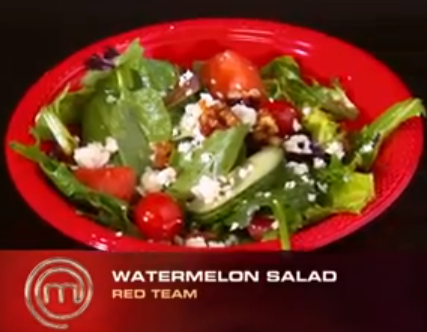 The Red Team produced Chicken Orzo, Watermelon Salad with Cucumber and Feta, White Pizza, Cheesy Lasagna and Fresh Berries with Cream. 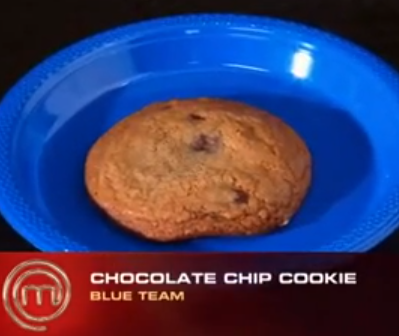 The Blue Team had several issues with their service (including running out of food) so the Red Team was declared the winner. Since I am not going to be cooking a five-course meal for 350 people anytime soon, I decided to use this challenge as an excuse to try some recipes that I have been wanting to take a stab at. 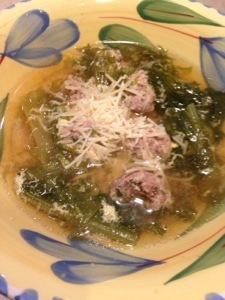 For the soup portion, I wanted to try Giada de Laurentiis’s Italian Wedding Soup Recipe. I followed the recipe completely and it was so simple and tasty. If I did it again, I might try adding some other types of vegetables and seasonings to give it a more complex flavor but this is a great recipe for a straightforward, delightful dish. The salad course was where I decided to get a little adventurous. 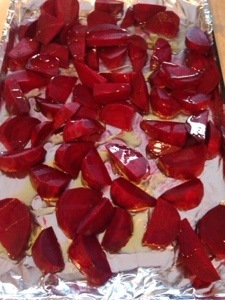 I saw this recipe a while ago and I knew that I wanted to try it: Roasted Beet and Citrus Salad with Mustard Vinaigrette. I had not planned on making any changes to this recipe but my grocery store had other plans. It did not have golden beets, microgreens, ruby red grapefruit, valencia oranges or blood red oranges. So I had to improvise. 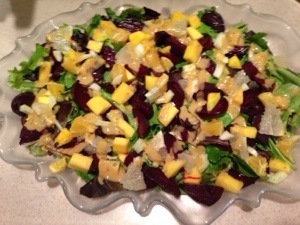 I kept the roasted beets (all red), mixed greens, fennel and mustard vinaigrette, but everything else was different. I used mango, navel orange, and pomelo on the salad and eliminated the pistachios all together (because I do NOT enjoy nuts in my food). 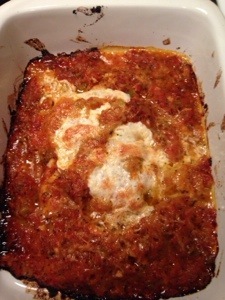 While it was nothing like what I had originally set off to make, it was really delicious! 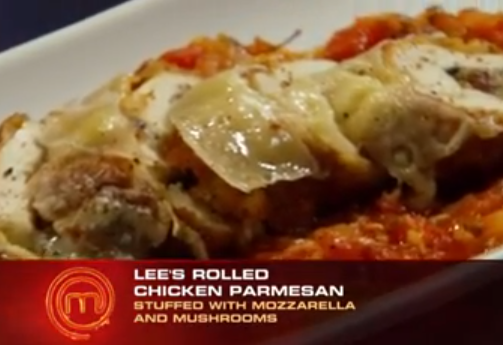 This was my dad’s favorite dish of them all and it was definitely one of the best from my point of view as well. It’s a really unique and flavorful dish, and it looks totally beautiful with all of the bright colors of the fruit and vegetables. It is something that I will definitely do again when I want to impress people at a dinner party. The pizza course was another one that I decided to have some fun with. 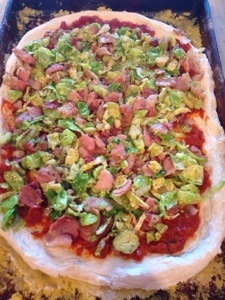 I saw a recipe for Brussel Sprout and Bacon Pizza recently, and given how much I love both ingredients, I knew that I had to try it. I pretty much followed the recipe, but it called for A LOT of resting time for the dough (both in the refrigerator and at room temperature). 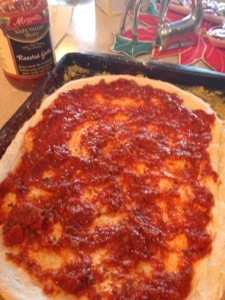 I was way too impatient (and hungry) to wait so I skipped most of the resting time and the dough was still wonderful. I’m sure it would probably have been better if I had followed the recipe exactly… but if you can get really tasty dough in half the time (or less), why the hell not? Overall, the dish really surprised me. 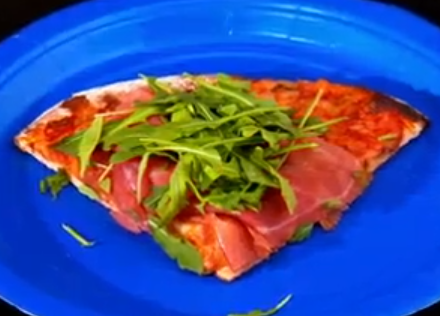 It was unique but still tasted just like a pizza, a REALLY good pizza but pizza nonetheless. 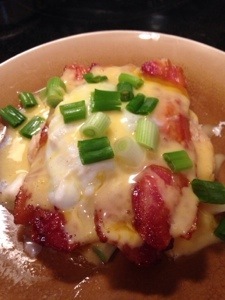 This was one of my Mom’s favorite dishes of the day and it is definitely one that I want to make again. 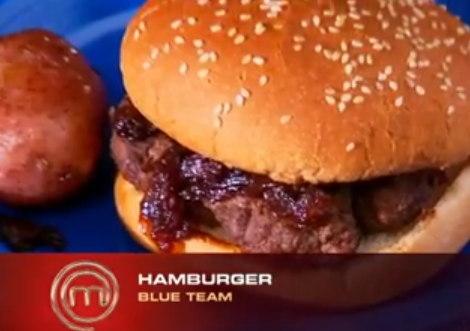 I think it would also be really good (and a little more unique) to substitute the tomato sauce for a barbecue sauce or garlic cream sauce to switch up the overall flavor. (I’ll let you know how that goes when I try it). 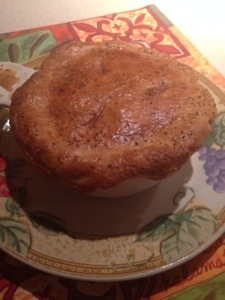 The pot pie turned out great. 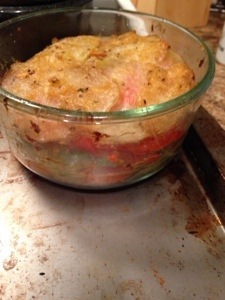 The crust was flaky and delicious and the filling was super flavorful. 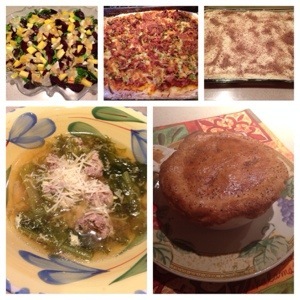 It was a great dish and a wonderful way to utilize all the extra turkey from Thanksgiving. 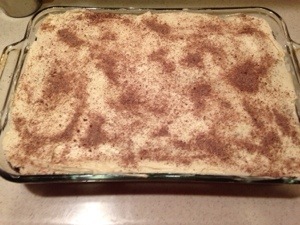 Finally, for dessert, I decided to try my hand at a homemade cake. 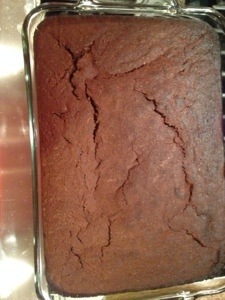 I found this recipe: Spicy Chocolate Stout Cake and I knew I wanted to try it as soon as I saw that it called for Guinness (one of my favorite beers). 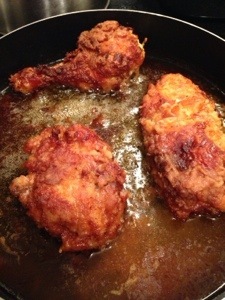 For the batter, I kept everything the same except I added a pinch of cayenne pepper to give it a little more of a kick. I wasn’t a huge fan of the idea of the peanut butter frosting so I decided to switch that out to a Salted Caramel Buttercream Frosting Recipe. It was more work because I had to make the salted caramel sauce but it was SOOOO worth it! I am honestly not all that into cake. I mean, it’s good, but I’d rather have almost anything else for dessert. I could eat this cake, though, all day long (which may prove to be an issue). The caramel frosting and the spicy chocolate went so well together. And it ranked in as one of my mom’s favorites as well. While it certainly took me a while to cook my way through this challenge, it was a lot of fun to try a lot of recipes that I have wanted to. They were all delicious but the ones that I want to have more of right now are the roasted beet salad and the brussel sprout and bacon pizza. In fact, I’m going to go have some more right now! 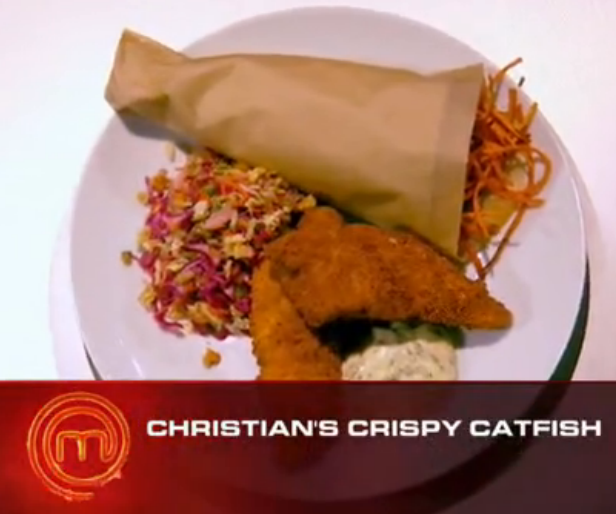 Having won the mystery box challenge, Christian was able to select the type of European cuisine that the rest of the contestants had to create a dish for. 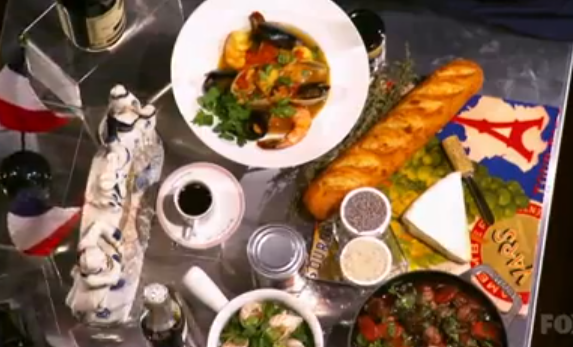 He selected French cuisine. 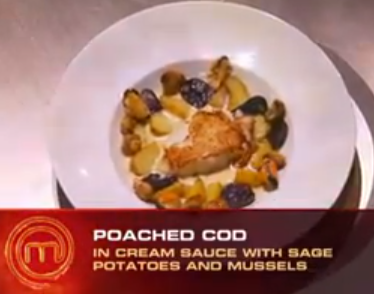 Derrick (Gougére) and Max (Poached Cod) had the best dishes and therefore became the team captains for the next challenge. 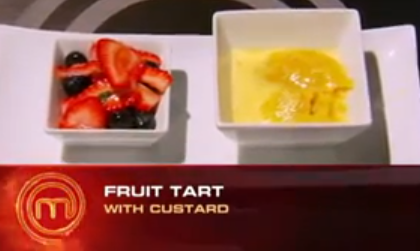 The bottom three were Angel (Fruit Tart), Erryn (Beef Carpaccio) and Mark (Peppercorn Crusted Filet), with Angel and Mark being sent home. I honestly had no idea where to start with this one. I know next to nothing about french cooking but I knew I wanted to try and master a classic. I did some research and I just couldn’t decide between The Pioneer Woman’s Coq Au Vin or Julia Child’s Beef Bourguignon. Since I am still working full time, I decided to stick to the 2 hour dish instead of the 6 hour one, but I will definitely attempt some Julia Child soon! To make sure I made the classic french dish correctly, I stuck completely to the recipe. 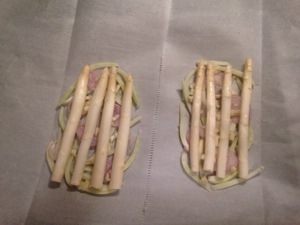 The pictures below show the different stages of the dish as I compiled it prior to putting it in the oven. The instructions I used to make the noodles were as follows. 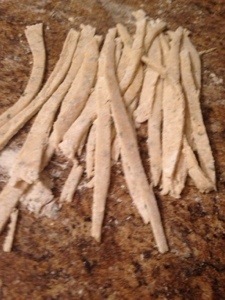 The pictures below show the finished noodles before and after cooking. Stir flour, thyme, and salt together in a mixing bowl. Make a small well in middle of bowl and put egg yolk and water in there. Stir until well blended. Shape into ball. 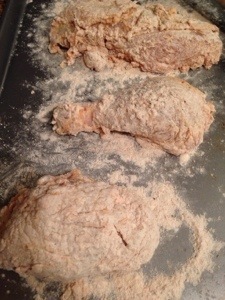 Place dough on lightly floured surface; flatten slightly. Knead 5 minutes or until dough is smooth and elastic, adding more flour to prevent sticking if necessary. Cover with plastic wrap. Let rest 15 minutes. 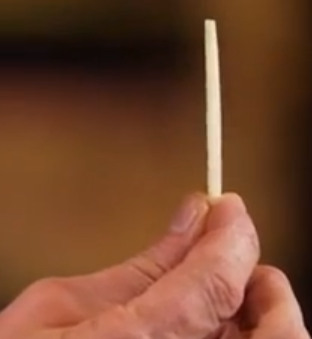 Roll out dough to 1/8 inch thickness or thinner on lightly floured surface. If dough is too elastic, let rest several minutes. Let dough stand about 30 minutes to dry slightly. Cut strips into desired length and width. Boil in liquid until al dente. 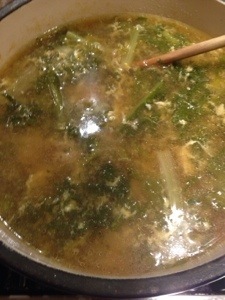 I usually use chicken stock but you can use any liquid you want. The final dish turned out great. (See below). 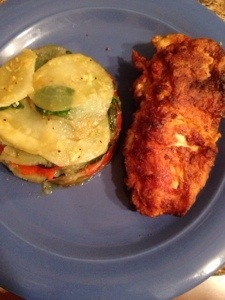 The chicken was tender and the vegetables and sauce were delicious. 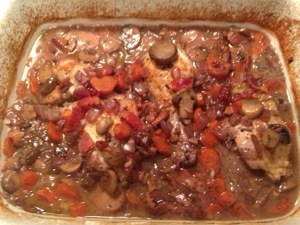 I’m not sure what Coq Au Vin is supposed to taste like but this was FANTASTIC! 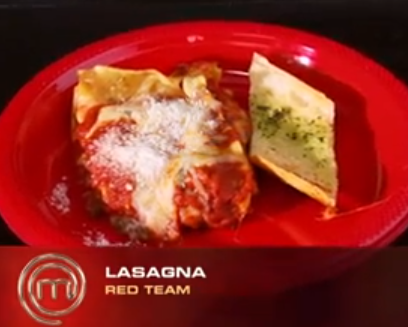 The noodles were a little thick (I really need to get a pasta maker), but overall I’d say this dish is a winner, especially with the hodgepodge the contestants created in this challenge. 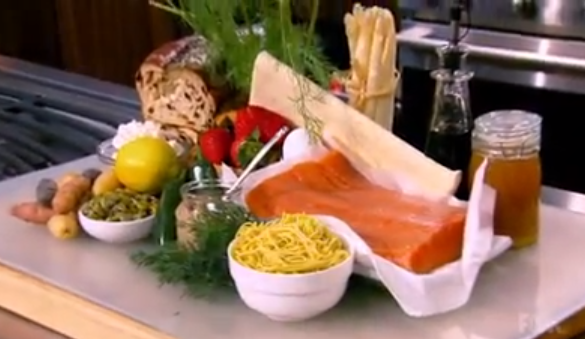 For the first mystery box challenge of the season, contestants had to create a dish using some of the following ingredients: salmon, strawberries, fennel, white asparagus, ricotta cheese, fingerling potatoes, pistachios, balsamic vinegar, fresh dill, noodles, bread, lemon, honey and puff pastry. 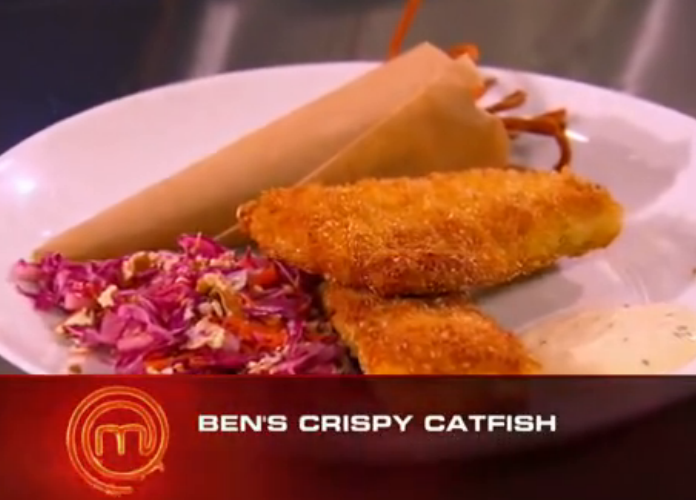 Going against the typical grain of the mystery box challenge, the judges decided to announce that Ben made the worst dish of them all, having overcooked the salmon and prepared a “hideous” sauce to go with it. 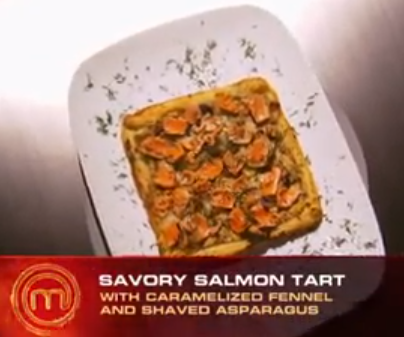 Suzy (Trio of Salmon), Christian (Pistachio Crusted Salmon), and Jennie (Savory Salmon Tart) won the judges’ praise for their dishes, with Christian being declared the ultimate winner of the challenge. 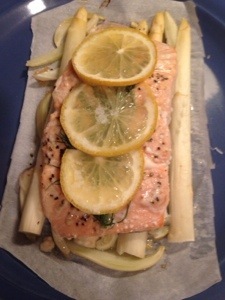 I had never worked with fennel or white asparagus before so I knew I wanted to do a dish that featured both ingredients along with the salmon. 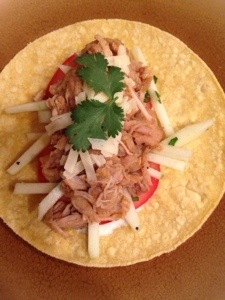 I have also been wanting to try the “en papillotte” technique so I found a base recipe that I could tweak in order to make a great dish that used several of the mystery box ingredients. 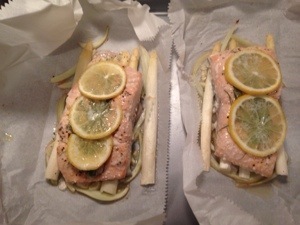 I mostly followed this recipe: Salmon and Fennel Baked in Parchment. 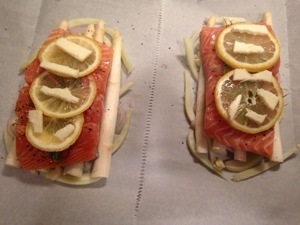 The only thing I really changed was including 5 thin slices of shallot, 1 clove of garlic (coarsely chopped) and 2 pieces of asparagus (each cut in half lengthwise) under the salmon. Overall, the dish turned out great (and it was SO simple to do). 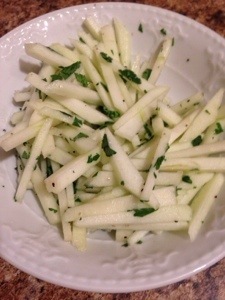 It could have used more salt though and I should have sliced the fennel much thinner. I’m not a huge fan of the taste of fennel and this dish definitely did not change my mind, but it did give a nice flavor to the other components. I certainly think I would have been safe in this round but I’m not sure I would have cracked the top three. 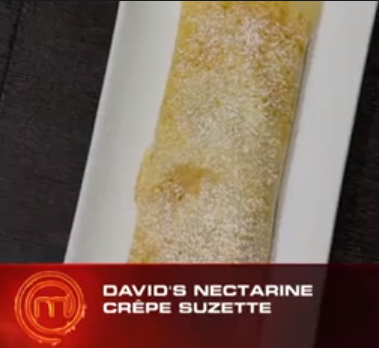 24 contestants survived the apple slicing test and went on to the first cooking test of the season. 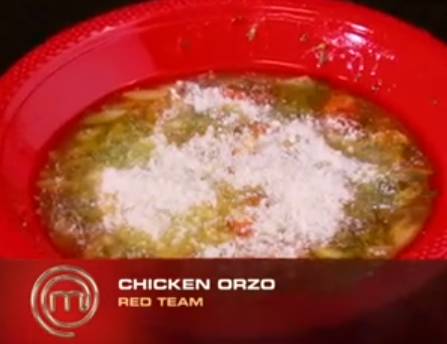 To get the contestant field down to the Top 18, they had to create a great dish featuring chicken. Most individuals played it relatively safe – sticking to what they knew best. 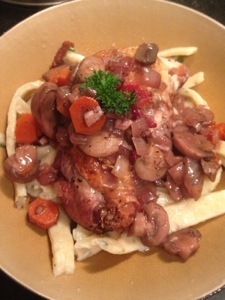 I cook with chicken all the time and have several go-to recipes. 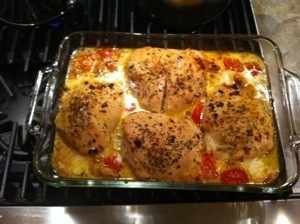 One of my favorites comes from Chrissy Teigen’s blog: Boursin and Bacon Stuffed Chicken Breast. I follow the recipe for the most part but I have experimented with stuffing it with roasted red peppers, onions, and spinach in addition to the bacon and boursin. Wrapping it in prosciutto is something that I don’t always do. 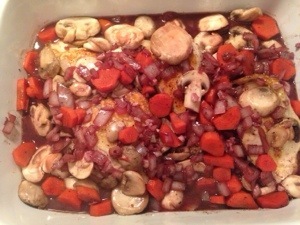 And I also bake it with chicken stock in the pan to keep the chicken moist. 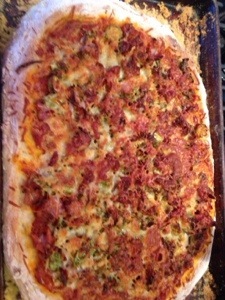 Below is a picture of one of my versions of this recipe. 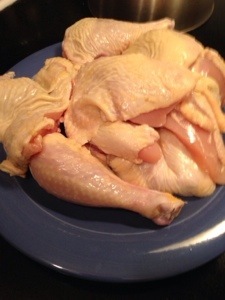 First, I decided that I wanted to try my hand at breaking down a chicken so I used this tutorial: How to Break Down a Chicken. It certainly wasn’t easy but I was able to do it and the tutorial was hugely helpful. Although pausing and playing a video on your computer when your hands are covered in chicken goop is certainly an interesting trick. I may have used my nose and elbow at various points in the process. 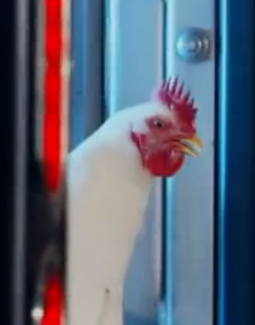 Regardless, I broke down the chicken relatively easily and didn’t get any salmonella on my laptop. I’d say that’s a win. In addition to breaking down the whole chicken, I knew I wanted to try something that I’ve never done before but always wanted to: Crispy Fried Chicken. 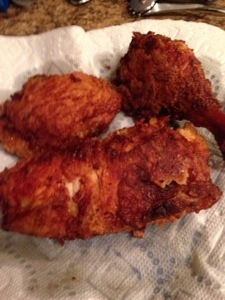 I followed the recipe completely and the chicken turned out great! Although the entire time I was making it, this is what I thought about: Shake that! For my side dish, I had this idea to do a potato, spinach and red pepper cake, but I had no idea if it would actually work. 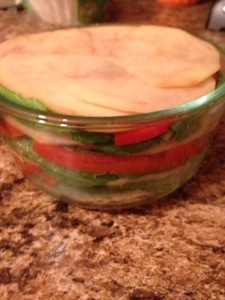 I thinly sliced 1/2 a russet potato and 1/2 a red bell pepper. Then, I made a butter sauce with 4 tablespoon of butter, a finely grated shallot, 3 cloves of garlic (also finely grated), salt, pepper, paprika, cumin and oregano. 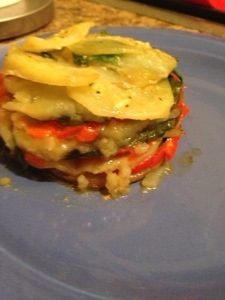 Then, I layered them (potato first, followed by butter sauce, spinach and peppers) in a small round dish and baked it in a 350 degree oven for 20-30 minutes (until the potatoes were tender). When it was done, I turned it out onto the plate. It wasn’t very pretty but it mostly stayed together and it tasted great. While everything was really tasty, it definitely did not look gourmet. 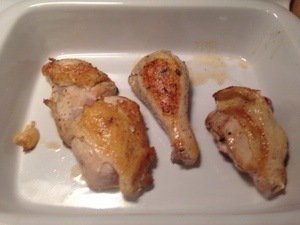 I also should have done a sauce to go with the chicken because I ended up using honey mustard to dip my chicken in (which was delicious… don’t judge). I doubt this would have played well with the judges but it was a great dinner for tonight. 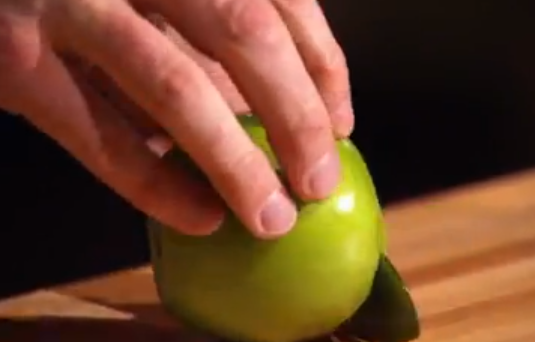 Another season of challenges begins with a straightforward skills test in which the contestants must prove their precision knife skills by skinning and thinly slicing granny smith apples. I have never had great knife skills, mostly because I’ve never really had great knives to work with. I did my best but my cuts were a little jagged. The slices were sufficient but definitely not perfect. Even though this was only a skills challenge, I decided that I wanted to make a dish with the apples I sliced, and nothing goes better with apples than pork. I have been wanting to attempt carnitas and thought that this would be the perfect excuse. So I made carnitas tacos with an apple slaw and tomatillo cream. 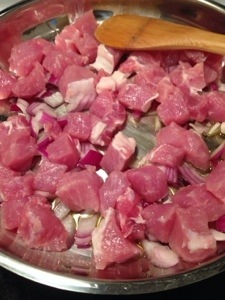 I cut up just under 2 pounds of boneless pork loin in to large chunks and browned it in a pan with some olive oil and chopped red onion. Then, I put the Frontera carnitas sauce with a little over a cup of water in the pan. I simply covered the pan and let it cook for around 2 hours in a 325 degree oven. 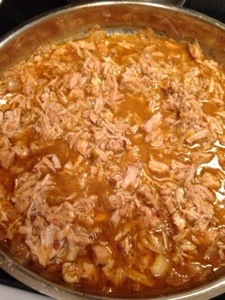 When the pork was done, I shredded it with a fork and let it simmer on low while I finished the rest of the dish. 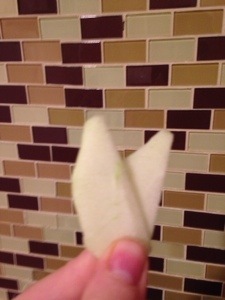 I used the granny smith apple that I had sliced before and julienned it. Then, I mixed it with some chopped fresh cilantro, the juice of 1/2 a lime and some salt and pepper. 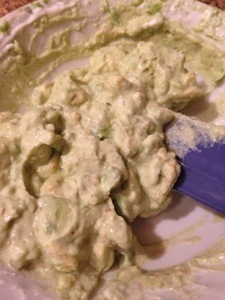 Next, I mixed some sour cream and tomatillo salsa to make the tomatillo cream, and thinly sliced a vine-ripened tomato. With everything complete, I compiled the dish by spreading the tomatillo cream on a corn tortilla and then layering on the tomatoes, apple slaw, and carnitas. Finally, I garnished it with quesadilla cheese and fresh cilantro. (See finished product below). The tacos were great! The carnitas mix was a little spicier than I’d anticipated but the apples paired perfectly with the pork. Aside from the dish being time consuming, it was really simple. And it would have worked well in a crock pot too. I’m very excited to see what season 2 will bring. It definitely seems like the home cooks are a step up from last season so it will be interesting to see if I can keep up this time around. 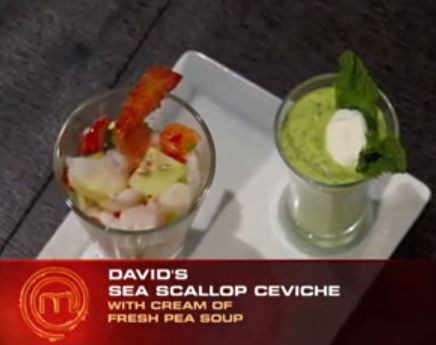 It has all come down to this for Season 1: Whitney vs. David in three rounds: Appetizer, Entrée and Dessert. 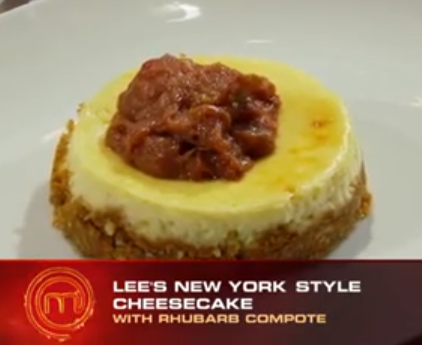 The chefs were given two hours to impress the judges with three dishes, and they definitely did. 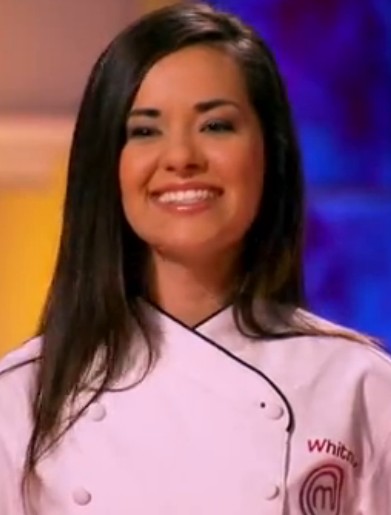 However, Whitney impressed them a little more and took home the crown as the first MasterChef winner. 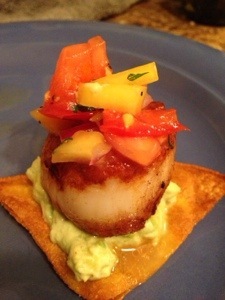 For my first course, I decided to do a seared scallop on a mini-tostada with mango salsa and avocado cream. 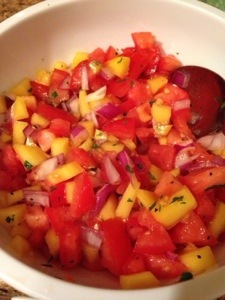 I first made the mango salsa, which is a recipe that I have developed over the years. It is really simple. I just threw together 1 mango (diced), 2 medium tomatoes (diced), 1/2 of a small red onion (diced), 1 jalapeño (finely chopped), the juice of 1/2 a lemon and 1 lime, 10 fresh cilantro leaves (finely chopped), 2 tablespoons of olive oil, and salt and pepper to taste. I mixed it together and let it marinate in the fridge while I worked on the other components. (See finished product below). 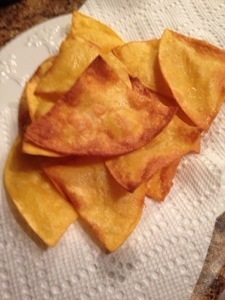 I fried a couple of corn tortillas (cut into fourths) in some vegetable oil for a couple minutes on each side. Then, for the avocado cream, I mixed 1 avocado, 2 tablespoons of sour cream, the juice of 1/2 a lime, 1 tablespoon of tomatillo salsa and a pinch each of cayenne pepper, salt and pepper. I mixed it up as well as I could but, unfortunately, I do not currently have a food processor to get a nice, smooth consistency. It was a little lumpy, but it tasted good and that’s all that really matters. Finally, I seared the scallops, using this as a guide: The Perfect Scallop. I followed it exactly and the scallops came out perfectly as a result. The completed dish (below) was DELICIOUS! 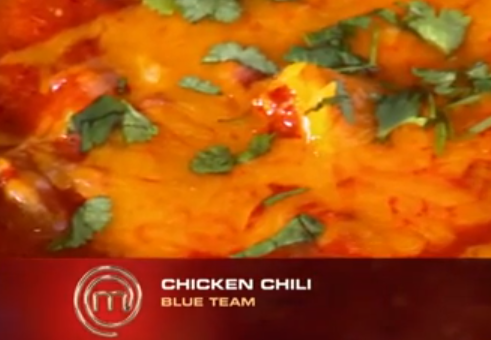 The flavors went together really well. It was kind of difficult to eat, but it was so good that I didn’t care. This is definitely one of the best things I’ve made this far. 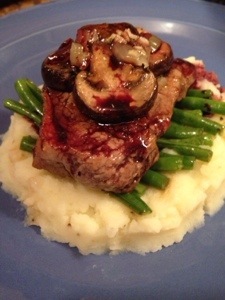 For the entree, I found some great lamb at the store and decided to serve it with mashed potatoes, green beans and mushrooms in a garlic and thyme red wine sauce. Everything with this was really simple. For the mashed potatoes, I skinned and boiled the potatoes until they were cooked through. Then, I mashed them with milk, butter, salt and pepper until smooth. For the green beans and mushrooms, I mixed them with olive oil, shallots, garlic, salt and pepper and roasted them in a 400-degree oven until they were tender. For the sauce, I reduced some red wine by half with a sprig of thyme and a clove of garlic. For the lamb, I seasoned it with salt and pepper, seared it on both sides and put it in a 400-degree oven for 10-15 minutes. The completed dish is below and it was really tasty. 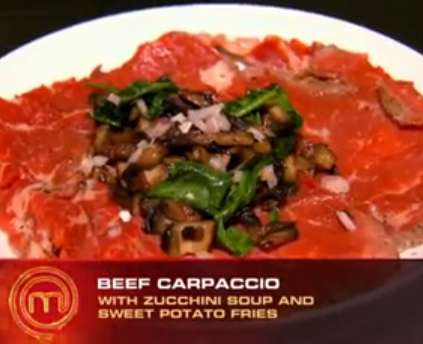 The red wine sauce could have been more flavorful but everything went together really well. And the lamb was tender and lovely. Finally, for the dessert, I decided to make pumpkin bread with chantilly cream, melted chocolate and caramel. 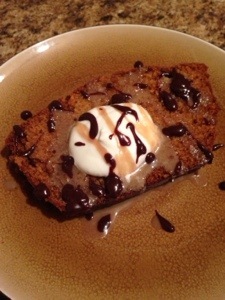 I used these recipes to create the dish: Downeast Maine Pumpkin Bread, Chantilly Cream, and Easy Caramel Sauce. While its not really a typical dessert, it was SO good! 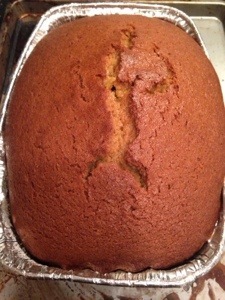 I love pumpkin and have been wanting to make some sort of pumpkin dessert for a while. This just sounded good to me today and I’m so glad I made it. Every dish I made today was really good. 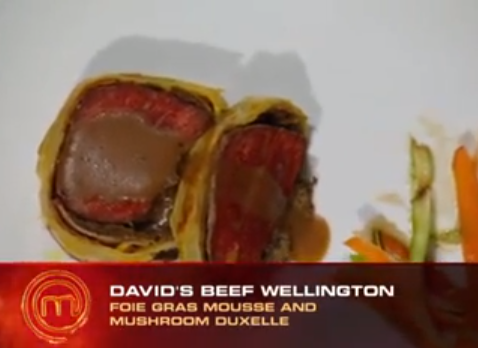 I think they certainly could have been on par with David’s and Whitney’s dishes. 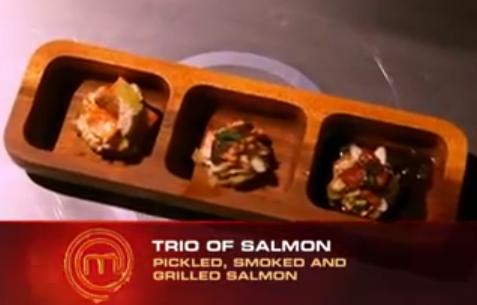 The only thing is I’m not sure how well these dishes work in a progression. Perhaps, that is something I can work on during the next season of challenges. Season 1 has come to an end, and I have already learned so much and tried so many new things. I am excited to undertake the next season’s worth of challenges so stay tuned! 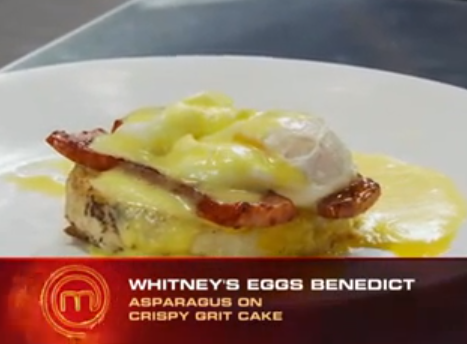 For the second semi-final head-to-head challenge, Lee and Whitney were asked to cook Eggs Benedict, Chicken Parmesan, and Cheesecake. 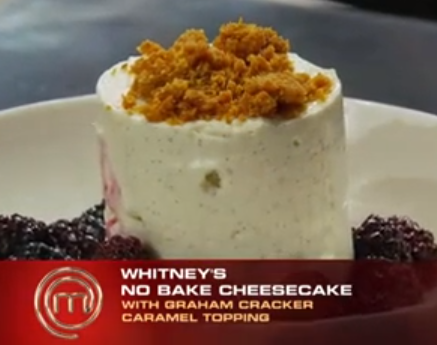 They both took risks and put their own twist on each dish but Whitney came out as the overall victor. For my eggs benedict attempt, I decided to take the straightforward and traditional approach. The only thing I did differently was use real bacon instead of canadian bacon, because let’s be honest, real bacon is WAAAAAAY better. 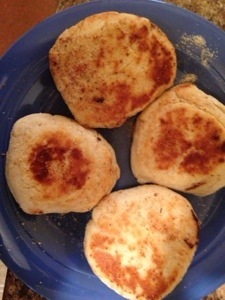 I also decided to try my hand at homemade english muffins by using this recipe: Homemade English Muffins. I used all-purpose flour instead of bread flour and I didn’t see any real difference. However, using the homemade version was definitely a good call, because they were delicious. I’m usually not that into english muffins but these totally changed my mind. (See below for finished product). 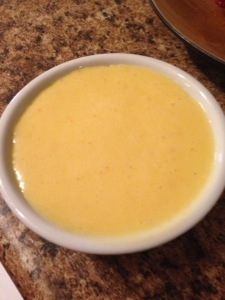 I also used these tutorials for the hollandaise sauce: How to Clarify Butter and Hollandaise Recipe. I poached eggs for my first blog post so this was the one component I felt confident about. I used this tutorial the first time and it was hugely helpful: Easy Poached Eggs. Funnily enough, the hollandaise ended up working perfectly (see below) but it took me three eggs to get one perfectly poached one. And then when I was plating it, the damn thing slipped off the spoon and the yolk broke. Looks like I’ll definitely need more practice with that! Regardless of the egg mishap, everything went together fantastically! 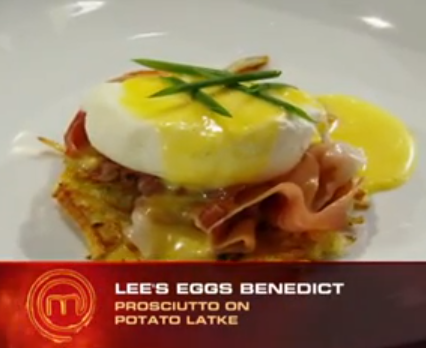 I’m not usually a fan of eggs benedict but this was SO tasty. 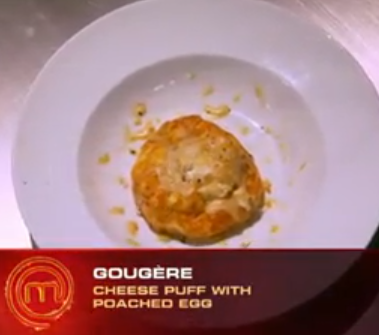 Even though the flavors were great, the broken yolk would have been a major issue on the show. So I don’t think there’s any way I could have won this round. But it was still damn good for a home dish (see below). For the chicken parmesan, I decided to make my own sauce with fresh tomatoes. I roasted 5 medium, vine-ripened tomatoes (cleaned and cut in half) in the oven for 10 minutes at 450 degrees. When they were cool, I took the skins off and then crushed the tomatoes with my hands. While the tomatoes were roasting, I cooked a medium shallot (chopped), a stalk of celery (chopped) and 3 cloves of garlic (minced) in some olive oil until they were translucent. Then, I added the crushed tomatoes, a bay leaf and about 1/2 to 1 teaspoon each of brown sugar, cayenne pepper, basil, oregano, thyme, salt and pepper. 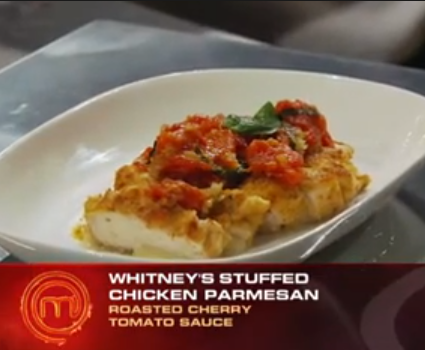 I let this simmer on low for about an hour and used this recipe as a guide for the rest of the dish: Chicken Parmesan. 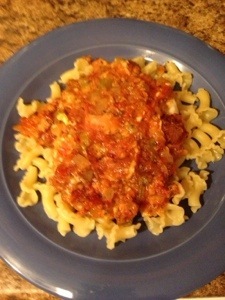 I served the finished chicken on a bed of pasta (see below) and it was great! It didn’t look like a restaurant-quality dish but it certainly tasted like it. It was a tad bit spicy, but overall it was very tasty. 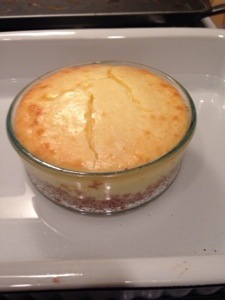 Finally, for the cheesecake, I used this as my base recipe: Classic Cheesecake Recipe. I followed this recipe completely (just made a smaller version), but I chose to freeze it instead of refrigerate it to speed the process up. 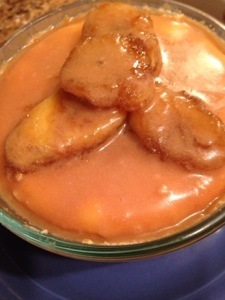 Instead of the suggested sour cream topping, I decided to top the cheese cake with caramel and flambeed bananas. 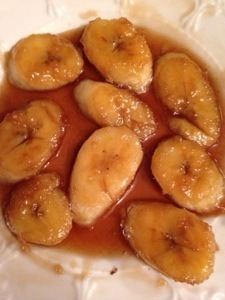 I used these recipes as guides: Easy Caramel Sauce Recipe and Martine’s Flambéed Bananas. (Finished components and the the compiled dish are below). Each component tasted fantastic! But the cheesecake was more tart than I had anticipated (I must have used more zest than I should have) and it didn’t pair as seamlessly with the bananas and caramel as I thought it would. 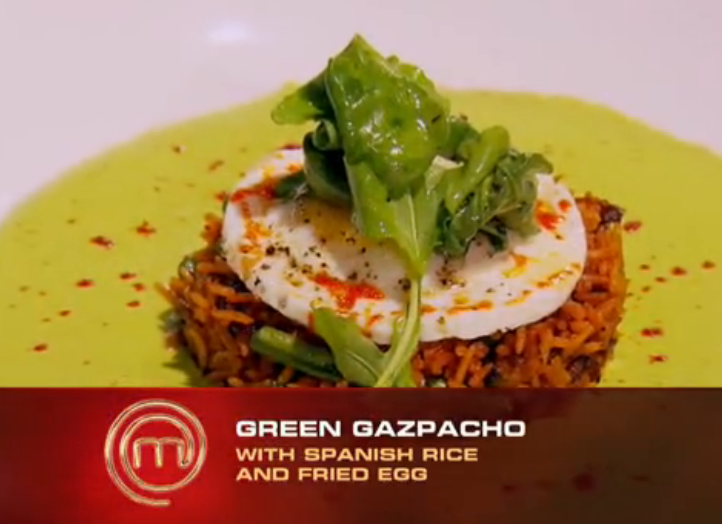 Overall, everything worked out well but there was something slightly off with each dish. I don’t think I would have been in contention during this challenge but I tried a lot of new techniques that (mostly) worked out. It was a challenging day for sure, but it was a lot of fun trying new things.